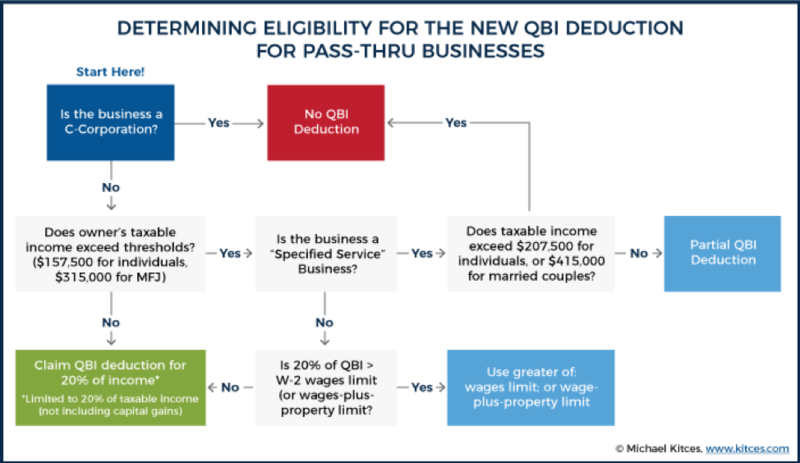 The changes from the Tax Cut and Jobs Act (TCJA) passed at the end of 2017 vary for businesses depending on the structure of the organization (i.e. C Corporation versus a pass-through entity such as a sole-proprietorship, partnership, S Corporation or limited liability company). A specified service business is defined as one that is involved in the performance of services in the fields of health, law, accounting, actuarial science, performing arts, consulting, athletics, financial services, brokerage services or any trade or business where the principal asset of such trade or business is the reputation or skill of 1 or more of its employees. It also includes businesses that involve the performance of services that consist of investing and investment management, trading, or dealing in securities, partnership interests, or commodities. Other significant changes in the new tax law relate to business asset depreciation. Businesses will now be able to accelerate the amount of depreciation on new property and equipment through new limitations on bonus depreciation and Section 179 expensing. Beginning in 2018, Section 179 expensing allows a business to write-off up to $1,000,000 of the cost of new and used property and equipment in the year of purchase. Bonus depreciation will also increase to 100% of both new and used property. The bonus depreciation for previous years allowed only a 50% deduction. This bonus depreciation is retroactive to property placed in service after September 27, 2017 and before January 1, 2023. Consult with a tax professional or Certified Public Accountant to ensure you are taking advantage of every applicable deduction and tax benefit in order to minimize your company’s tax liability.